Power is transmitted from source to the place where it is required in many ways. Principle types are explained below. When power is to be transmitted from one shaft to another shaft belt drive is more commonly used. The power is transmitted form one pulley to the other by the frictional resistance between the belt and the pulley. In practice, however, certain amount of slip takes place in this method of drive and little creep too develops. Hence the drive is not positive due to the slippage of belt. Since belts are flexible they are not only used to connect parallel shafts but also shafts located in more than one plane may be connected by twisting the belt. Two pulleys of either the same size or of different size may be connected, as to give an open drive or crossed drive. In the open belt drive the direction of rotation of both the pulleys will be the same, whereas in the cross belt drive, the direction of the driven pulley or wheel is reversed, and the arc of contact between the belt and the pulley is increased. When two pulleys are coupled by a belt, pulley mounted on the shaft of an electric motor is called the driver, and the pulley to which it is belted is called the driven. If both the driver and driven is of the same size or diameter, both will rotate at the same speed or revolutions per minute. If the driver pulley is twice the size of the driven (DN) pulley then the smaller will rotate at twice the RPM of the larger (DR). The general rule therefore is smaller the pulley the faster it rotates, and larger the pulley the slower it rotates. 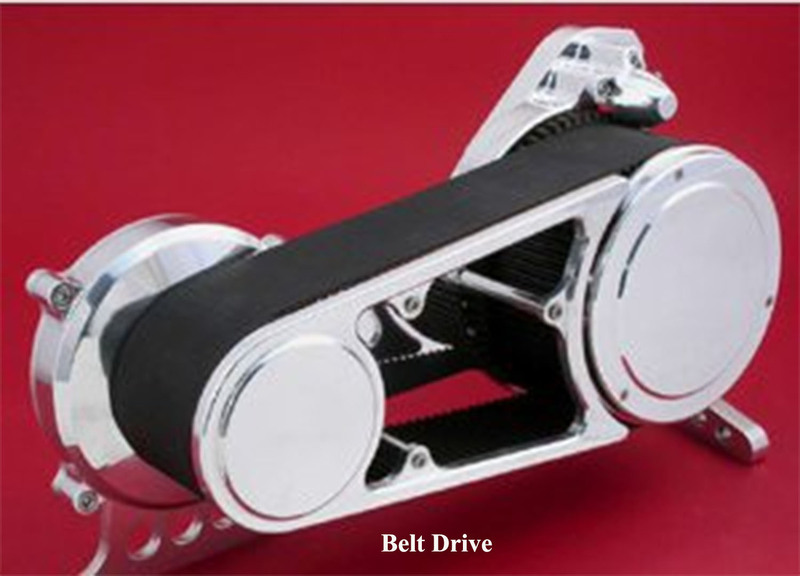 Considering the open belt drive when the driver begins to rotate, the tension in the lower portion of the belt is increased and therefore that portion of the belt stretches. At the same time there is a decrease in tension to the top side. The lower side is called the tight side (T1) and the top side is called the slack side (T2). The tensions of both the sides are unequal. This difference in tension coupled with force of friction makes the belt drive possible. The centre distance between the pulleys should not be less than three times the larger diameter pulley and ratio of pulley diameter should not normally exceed six to one. If condition is such that this ratio has to be exceeded, a Jockey pulley should be fitted to increase the arc of contact on the smaller pulley. (a) Leather. Generally leather belts are of single thickness, but two or more belts may be cemented or stitched together. The thickness of the single belts differs from 7/32” to ¼” and the double belts from 11/32” to 3/8”. Leather belt should be kept separate and free from cracks by applying some form of dressing. Tallow is the best for this purpose. If belt slips, to increase the friction between the belt and pulley, powdered resin may be applied. (b) Cotton and Canvas. These belts are woven and folded longitudinally to form the plies which are stuck together with cement or rubber solution. These belts are made in various thicknesses. The strength of these belts is about the same as that of leather belts. Greasy dressing should never be used to woven belts. (c) Rubber. These are useful in damp places and out of doors. These are not very reliable in comparison with the cotton and canvas belts because the presence of moisture causes the plies to come off. (a) Bats. Bats belt fasteners are used for medium size belts. (b) Jackson. Jackson belt fasteners are used when driving heavy drive on commercial purpose. (c) Clipper. Clipper used for belts of small width. (a) Flat Belt. These are usually made out of leather, canvas, cotton and rubber. These belts are used to connect shafts up to 8–10 m apart with speed as high as 22 m/s. (b) V’ belt. These are made of rubber impregnated fabric with angle of ‘V’ between 280 to 400. These are used to connect shafts up to 4 m apart. (a) Split Pulley. This is used on main shaft from where the drive is taken to the respective machines. In order to mount these pulleys anywhere on main shaft easily, these are made in two half and rigidly bolted together. These pulleys are made out of cast iron or sometimes out of wood also for lightness. (b) Fast and Loose Pulleys. These pulleys are fitted on the counter shaft and are made out of cast iron. The fast or tight pulley is keyed to the shaft where as the loose pulley which is fitted with a bush in its bore is free to rotate on the shaft. The bush fitted in the bore of the loose pulley if worn out may be replaced. (c) Flat Pulley. These pulleys may be of single flat type or may be of cone pulley type in which three or four different diameters are made in order to obtain the change in speeds. These pulleys are not actually flat. They are tapered slightly towards the centre from either side so that the diameter of the pulley is a little larger at the centre. This is called “Crown”. Some pulleys may have convex shape periphery. The reason, why the flat pulley is made slightly larger in the centre is that a flat belt will always climb towards the highest part of the pulley. So if the centre is slightly higher, the belt will run and stay in the centre of the pulley, which is most desirable condition. d) “V” pulleys. Grooved pulleys for V–belts are generally made entirely of cast iron, but occasionally the arms are made of wrought iron. They are mainly used for the transmission of large powers over great distances. The effect of the groove is to increase the frictional grip of the belts on the pulley and thus reduces the tendency to slip. The grooves on the pulleys are V-shaped. The angle between the two faces being from 280 to 400. The belt rests on the two sides and not on the bottom of the groove. (e) Guide pulley (Jockey pulley). Guide pulleys are mainly used to adjust the tension of the belt and also for right angle drive. A single endless belt may connect the shafts which are not parallel and which may not intersect, if guide pulleys are used. The belt will run equally well in both direction, and the guide pulleys do not affect the velocity ratio between the driver and driven pulleys. Guide pulleys are also used when the shafts to be connected are very close. By properly placing guide pulleys it is possible to make the belt run equally in either direction. It gives more tension to the belt. Belt Creep. The word creep indicates the lateral shifting movement of the belt. If the driver and driven pulleys are not parallel, the belt is likely to move or creep towards the lower side of the pulley. This action of the belt coming out of pulley is called the creep. It might also occur if the surface of the pulley is worn out considerably. (a) A comfortable working system for a single belt is about 50 lbs per inch of breadth and for double belt 80lbs per every inch. (b) A belt running with a soft flesh side makes the pulley wear less. (c) When a pulley has an appearance of polished silver then belt may slip. To avoid this, apply belt grease. (d) The driving side of the belt should be kept moist (sticking). (e) When a belt gets saturated with the oil, apply chalk powder to absorb oil. (f) Maximum speed in belt drive should not exceed 4000 ft/min. The ropes are often used instead of belt for transmitting power especially when the shafts are at long distance apart. Cotton ropes are based an account of the flexibility but manila and hemp ropes are also used as they are less flexible than cotton ropes. The use of ropes necessitates grooves on pulleys to increase frictional grip on rope and thus reduce the possibility of rope slipping. When large amount of power is transmitted to a greater distance wire ropes are used. The bottom of groove in this case consists of wood, composite wood and leather etc. The wire ropes make contact only at the sides of the groove and not at the bottom. There is no slip and driving efficiency is high. The loss of power in a well designed chain drive does not exceed 2%. It occupies little space and gives efficient service for the drives where the centre distance of two shafts is too small for belt drive and too large for gear drive. There are several types of chains used for transmitting purpose. (b) Bush or roller type for low and medium speed. 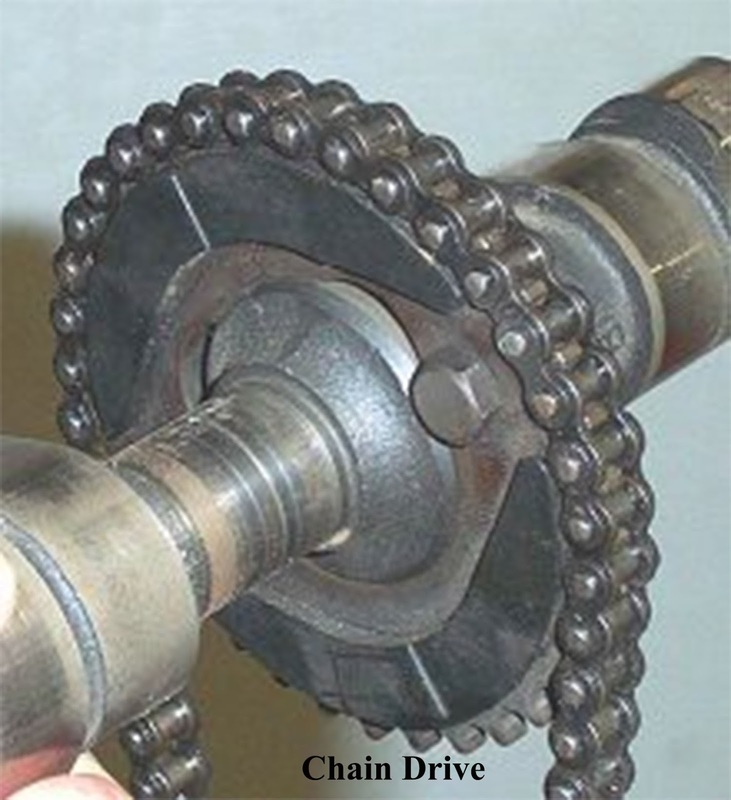 The chief drawback of the use of chain is stretching of links, which takes place after sometimes due to wear of pins and rollers. 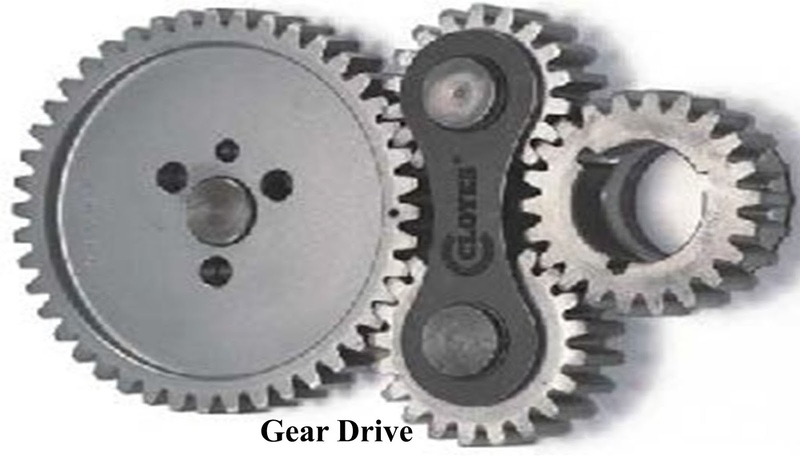 Gear drive is used when power is to be transmitted positively (i.e. without any slip taking place in the drive) and a constant velocity ratio between two shafts is to be maintained. The speed ratio between two shafts connected by means of two gears (spur) depends upon the number of teeth cut in both the gears. Normally smaller gear turns the bigger. Suppose a 15 teeth gear is driving a gear of 60 teeth. The smaller gear has to rotate 4 times to cause the bigger to rotate once. Therefore RPM of shaft will be inversely proportional to the number of teeth in the gear.